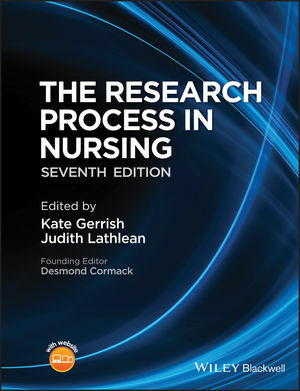 Comprehensive and thorough in scope, The Research Process in Nursing 7th edition provides everything you could want to know about research methods. This established textbook reflects the significant advances in nursing research and the importance of evidence-based practice, and provides an invaluable resource for both the novice and the more experienced researcher. A clear, explicit and easy to understand text which links theory with practical steps in the research process. Examples provided allow the reader to apply a variety of research concepts to theoretical learning and professional practice. Incorporates chapters, research examples, and policy from a range of international countries, including Canada, Australia, USA and Hong Kong. Easy to read for novice researchers and undergraduate nursing students, but at the same time provides sufficient depth and detail to be of value to experienced researchers and practitioners. Includes a brand new chapter on using new technologies in nursing research, ie social networking, video, new survey methods etc. An enhanced companion website, providing further additional support to both students and lecturers.